This class is designed for Healthcare Providers who are currently certified in ACLS and require re-certification. 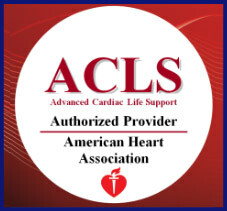 Those health care providers who regularly perform ACLS may feel comfortable with an ACLS refresher, however those providers whose job does not bring them into contact with ACLS situations daily are encouraged to take the full ACLS course. You do not have to hold a current license to participate in this course. Participants should have a current Basic Life Support (BLS aka CPR) for Healthcare Providers certification to get the most out of this course. Traditional recertification fee is $149 and includes all course fees including didactic portion fee, skills testing, certificate processing, and reporting to AHA. Traditional ACLS refreshers are run in conjunction with traditional initial certification courses. A traditional ACLS course is 16 hours delivered in either two 8-hour sessions or four 4-hour sessions. The recertification course is the last 8 hours of the ACLS initial course. If you are interested in Advanced Cardiac Life Support (ACLS) Recertification and are either unable to attend any of the current courses or there are none scheduled at this time, add your name to the waiting list.